With only one keyboard and mouse required to operate eight computer systems, the desk space can be made more ergonomically effective and reduces the time taken for operators to multiplex to different systems. 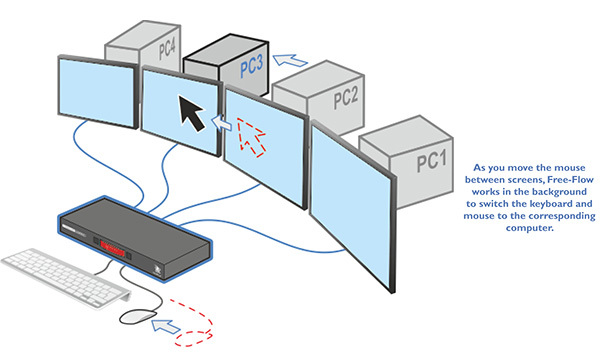 The CCS-PRO8 system is able to support up to eight monitors per computer. To enable Free-Flow on multi-monitor computers, a driver must be installed on the target computer. This feature is currently available for Windows computers only. The CCS-PRO8 unit can be controlled and switched via hotkeys, mouse clicks, Ethernet, Serial RS232 or remote 3 button mouse. Optionally, you can also use the RC8 remote switch to make your selection. With the open API, the unit can be easily set up and integrated into 3rd party systems. 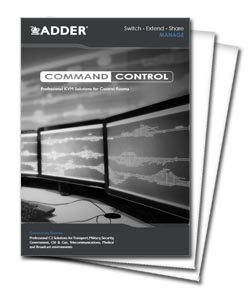 Adder's True USB Emulation technology overcomes limitations of other KVM switches by emulating the true character of the connected devices to all the computers simultaneously. This means that you can use the extra function keys, wheels, buttons and controls, without sacrificing switching times. The CCS-XB8 illumination module is an optional accessory which connects to the CCS-PRO8. It gives users the option to have a LED indicator positioned on each screen to identify which screen is currently controlling. The color and intensity can be controlled for each screen. A maximum of ten LED indicators can be supported. For mission critical applications, CCS-PRO8 now supports dual power inlets (Dual-AC). If one source fails, the CCS-PRO8 will switch sources to the other power supply, so as not to interrupt normal use of the connected servers. Users have the option to choose which computers stay alive. This prevents target computers from sleeping while not in use. Users can choose which source audio to hear. Nominate all or your own choice of computer(s) audio, no matter which computer you are using. Power Toby 3 pin jack x 2 (one power adapter included),100-240VAC 50/60Hz, 0.7A, input to power adapter. 12VDC, 18W output from power adapter. Hardware compatibility All computers equipped with certified USB 2.0 (or USB 1.1) connections. Computer Connections Audio 3.5mm in x 4, USB2.0 type B x 8. User Console Connections Audio 3.5mm out x 1, USB type A x 2 (Console- USB2.0 Low and Full Speed), USB type A x2 (Enumerated USB2.0.). USB specification for console connection Supports up to six Low or Full Speed devices. Keyboards which support multiple devices behind a hub can now be supported. The USB class of the supported devices on the console port is limited to HID devices only. It is not possible to use other USB devices e.g. card readers, memory sticks or touch screens on the console port. These devices need to be connected to the enumerated USB ports on the switch. CCS-PRO8 is also known as the CCS-PRO8-US and CCS-PRO8-USA. Question: We are looking at the CCS-PRO8 for 911 Control Center application. Would the CCS-PRO8 would support a peripheral Genovation keypad? As long as the manufacturer of the keypad supports the use of USB hubs the device should work, connected to one of the USB switched ports. It will likely not work connected to one of the emulated ports. If the keypad needs to be switched between computers, when channels are changed � e.g. the user switches from computer 1 to 2 - the keypad will be disconnected from one computer and connected to the next. Depending on the computer treats these reconnects the keypad may not be available for a few seconds (until the USB enumeration process finishes on the computer).